June 9th in Theme Lists, WordPress Themes, WP Solutions by Wordpress Jedi . We have all heard this before: “you can do everything with WordPress.” That’s actually true. WordPress is a powerful open source content management system that can handle any type of website, as long as you have the right theme. Best of all, in most cases, you won’t have to break the bank to get the job done. Starting an online store with WordPress couldn’t get any easier these days. There are plenty of WordPress themes that let you start your online store and don’t cost you much. There are some plugins that let you do that too. A job board can add a whole new dimension to your blog. It can not only help employers reach out to your community, it also provides unique value to your readers. The times are tough and any help you can provide your reader can only solidify your community. These job board themes let you start a job board with WordPress quickly. Lots of people use phpBB and vBulletin to start their forums. Did you know that you can do that with WordPress too? gForums is a good theme to do just that (our review). Sites such as Craigslist are very popular and quite useful for people who are looking for things they may not be able to find in stores. Of course, there is a whole lot more to Craigslist. Nevertheless, with these classified themes, you can start your own free or paid classified listing website fast. Everybody has seen Twitter and sites similar to that. It’s nice to be involved in those communities but sometimes you want to have your very own micro-blog. Thanks to micro-blogging themes such as this one you can get the job done quickly. Celebrity blogging is not for everyone. It can be very lucrative if you know what you are doing though. Thanks to WordPress celebrity themes, you can start your own celebrity portal using WP platform. That’s right. Facebook, Digg, Twitter, and CNN can all be cloned using WordPress. These WP clone themes should get you started. If you own an offline food business, there is no reason you should not start a website for your business to connect with your customers. These WordPress restaurant themes let you do just that. Those of you who own an offline retail business and want to reach out to more prospects online can use these retail themes to get started in a flash. Those of you who are passionate about blogging and want to go full-time with your blogging efforts are going to love using WordPress. These pro-blogging themes should give you a head-start with your efforts. We have all seen Yahoo! answers and Linkedin Q&A. You can use Answer theme to create a similar site fast. Those of you who are making a living out of selling and renting houses should take time to build an online presence for your business. These real estate themes let you accomplish that. Selling kid items can be profitable offline. It’ll be even more profitable if you have an online store. Kidz Store theme is just the solution for that. Developing an iPhone app is only the beginning. iPhone app developers need to promote their app properly if they want to be successful. Thanks to these iPhone WordPress themes, you can build a mini portal for your iPhone app in an affordable fashion. That’s right. Even churches need to have an online presence these days. It’s a great way to stay in touch with others and share updates with them. These church themes can make life easier. Your wedding is going to be one of the most important days of your life. That obviously goes without saying. Thanks to Mr. & Mrs. you can create an online site to cover your wedding. If you are looking for a job, you shouldn’t just focus on offline sources for leads. Sharing your resume online can open doors for you. MyResume is just the theme for that. The most common category of WordPress themes is “personal.” There are a ton of bloggers who use their blog to rant or share their thoughts with the world. Themes such as PersonalPress let you start your personal blog fast. If you are into gaming or just want to make money talking about games, these WP gaming themes are for you. Lots of people make a living out of traveling around the globe. You can too if you are into travel blogging. These travel themes should get you started on the right path. If you happen to live in one of those small cities, you may not have a decent site that covers your city’s events properly. Thanks to City Guide theme you can start one by yourself. Have you written an e-book? Maybe you want to monetize your existing book more effectively. E-book theme is just the template for that. If you want to build an online presence for your college or just want to start an online university, themes such as this one can help you out. More people are using video to communicate with the world these days. You can have your own video blog as long as you don’t have any issue showing up in front of camera or can capture decent videos on a consistent basis. If you are interested, these vlogging themes have you covered. Want to build a site to share your upcoming events with the world? Diarise is just the theme for that. Works with calendar solutions too. There are plenty of “mommy” websites around. You can have yours too. f1010 is a WordPress theme for ladies that can be used for that purpose. These days, if you are not taking advantage of social media, you are missing the boat. It helps if you put the effort to make your blog more social media friendly. Antisocial is one of those themes that is social media friendly right out of the box. Every startup owner should take time to start a website for his/her venture. These days, you can’t afford not to have one. Feature Pitch is a very easy to implement theme for startups that helps them share their information with the world online. Online directories may be old school, but you can still get some value out of them. DirectoryPress is a theme that enables you to start an online directory using WordPress. You want to get in the online coupon business? 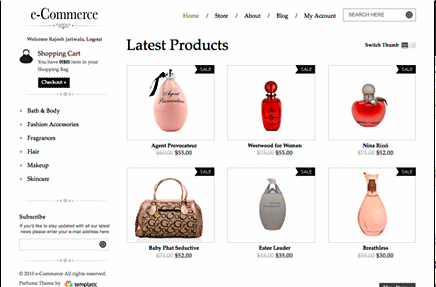 CouponPress is an attractive WordPress theme just for that purpose. Many assume that WordPress is only good for blogs. In reality, you can use it to develop sophisticated portals as well. 13Floor is one of many attractive CMS themes for WordPress. Pretty self-explanatory. If you want to develop a website similar to Hulu, OnDemand is just the theme for it. Businesses can get a lot of value out of WordPress. The platform is open source, gets upgrades on a frequent basis, and has tons of attractive business themes. I can’t remember the last time I saw a professional agency that did not have a website. If you are just starting or want to give your site a make-over, Agency Theme is worth a look. Photographers can use themes such as Family Tree to bring their work online and share them with the world. You can use WordPress portfolio themes to bring all your artwork online and share them with the world. A great way to get recognition for your art. Freelancing can be difficult if you are not using all the tools that are available to you these days. Every freelancer needs to have a website. Consultant theme for WordPress lets you build one quickly. Think we don’t have enough news sites these days? Maybe you want to start one yourself? These news themes for WordPress should do the job. Interested in starting a website about the environment and green technologies? Eco-Pro is one of many themes that lets you get the job done. It helps that the developers are willing to donate 10% of your cost to help save the environment. If you want to be the next top conservative or progressive blogger, these political themes should come handy. Gossip sites are very popular (beats me why). If you want to capitalize on this market and build a website covering it, gossip themes such as this one can help. WordPress can be pretty helpful for real estate brokers too. If you happen to be one and have multiple agents working for you, Broker Theme can help you manage them more effectively. There are plenty of community themes around. Lots of people use non-WordPress CMS to go about starting their own online communities. Themes such as Initiate let you do just that with WordPress. Want to start the next AllTop? Or maybe you just want to share your favorite feeds with the world. Accumulo and OneNews are two themes that help you accomplish just that. If you would like to start a local news site, WordPress is your best friend. These types of sites can be very helpful, especially if there are not too many alternatives available to your community. Local Theme is just the theme for that. Whether you want to take your paper magazine online or want to start a digital-only magazine, these magazine themes can help. Not all premium themes are created equal. Some are just better designed than others. Those of you who are aiming for a super professional-looking portal using WordPress should give Rocket Themes a try. Tumblr is quite popular among social media gurus. It’s yet another way to attract followers and drive traffic to a website. Themes such as Cinch let you start your own tumblog using WordPress. Want to start the next ESPN? Maybe you are tired of the same good old commentary by people on those sports websites. WordPress sport themes let you take your passion for sports to the next level. There you have it: 50 types of websites you can create with WordPress. Of course, WordPress is capable of much more. But the above solutions should give you an idea what this platform is capable of (don’t forget to check these WP coupons to save on some of the above themes). Is there any example of WordPress used as a Marketplace i.e. where users can sell their own products. Anyway, ClassiPress is probably what you want, it lets users post their own adverts (you can decide how much it costs them if anything).